The final entry for my autumn-inspired brews harkens back to high school. Not because of the beer I was drinking in high school (which is not worth recreating in my kitchen), but because of where I was spending those nights — at bonfires. Autumn always brought a return to burning leaves, branches, and wooden pallets stolen from the local grocery store. The scent still holds a special place in my memory, and I relish driving through Southern states where people dispose of leaf-litter by fire. My interest in smoked beer was piqued when I was introduced to the concept by Charlie Papazian’s The Complete Joy of Homebrewing. Smoked beer, or rauchbier in German, is made by smoking a significant portion of the grist, sometimes as much as 100%. Traditional rauchbiers are lagers made with beechwood smoked malt, but cherrywood and peat smoked malts are also available to homebrewers as well as the option of smoking your own malt if you have the equipment. I had planned a rauchbier with a traditional grist (although with only 25% smoked malt rather than the much higher proportions found in Germany), only exchanging lager yeast for a clean fermenting ale yeast, but my local homebrew shop had run out of two of the three malts I was planning on using, and doesn’t carry beechwood smoked malt at all. I ended up with the recipe below (for three gallons). 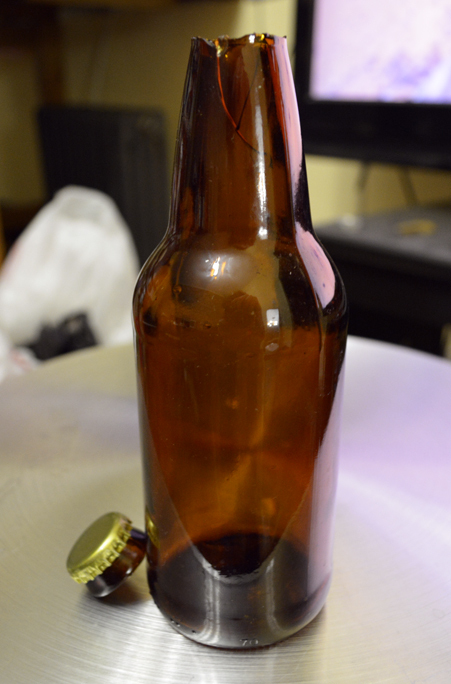 This bottle was decapitated by my bottle capper while packaging my honey saison. I was quite close in hitting my preboil volume and gravity targets, so I probably came close to my expect OG of 1.052, landing somewhere between 1.054 and 1.06 depending on the true values of my preboil volume and losses to trub. My wine thief unfortunately cannot reach far enough into my fermenter to take gravity samples from a three gallon batch. I forgot to make a starter yesterday, so I made one while bottling my honey saison and will pitch it before going to sleep (giving it approximately 12 hours on the stirplate). This entry was posted in beer, brew day, recipes and tagged autumn, bottling, German, kolsch, rauchbier, smoked beer on October 26, 2013 by Dylan Bargteil.